The Front Loader is engineered for use with your existing fork truck. 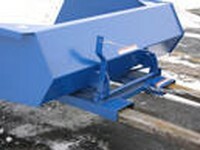 "Dust Pan" design is ideal for transporting snow, gravel, sand or refuse. Pull release cable to dump contents of scoop. Fabricated from steel with leak-proof welds. Attaches quickley and easily to most fork trucks. Beveled front edge for better scooping ability. The usable fork pockets measure 7.5"W x 2.5"H on 24" centers. Durable powder coat finish. Operation: Drive into Front Loader; Secure unit to fork truck mast with safety chain; Run release cable to fork truck driver; Drive Loader into the material your transporting; Drive to destination; Raise forks and pull release to dump load; Unit returns to locked upright position when set down on ground.